This image was chosen as the APOD (Astronomy Picture of the Day) for March 28, 2007, click here to see the archived APOD. 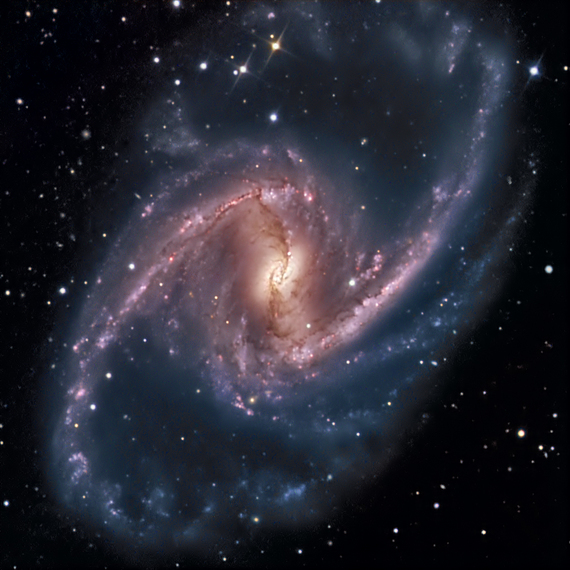 NGC 1365 is a giant Seyfert type galaxy in Fornax with a diameter of 200,000 light years. It is arguably the most prominant barred spiral in the sky. The bar rotates clockwise with velocities in the nucleus of 2000 km/sec resulting in one rotation in 350 million years. The knots seen along the bar are areas of intense star formation which occurs because the bar funnels material into this area to trigger star formation. It is thought that the nucleus contains a super massive black hole among the dust lanes visible in the image. The gravitational pertubation from the rotating bar form the very elongated spiral arms that are often difficult to capture in their entirety in optical images. These too have large knots of star forming areas. The seeing recorded on the Gemini South monitor on Cerro Pachon, 5 km away from PROMPT2, was recorded as low as 0.53 arc sec during the acquistion of the luminance data. To see first light image from Apogee U9, click here.